Storms are inevitable. Sooner or later, at one point or another, you will face a brutal storm. Thunder, lightning and gale force winds are not a great combination for trees. Yes, trees are extremely strong, flexible and have roots that spread deep underneath the earth, but even so, they are sometimes no match for a violent storm. When the storm wins, a few things can happen. Trees can be ripped out of the ground by their roots, usually causing a lot of damage and stress, or pieces of trees can be ripped off the body, also usually causing a lot of damage and stress. In the aftermath of a storm, we are here to take that stress away. The very first step after enduring a terrible storm is to contact us. We will come right away and survey the area and begin our plan of action. Usually the first thing we do is cleanup the area. 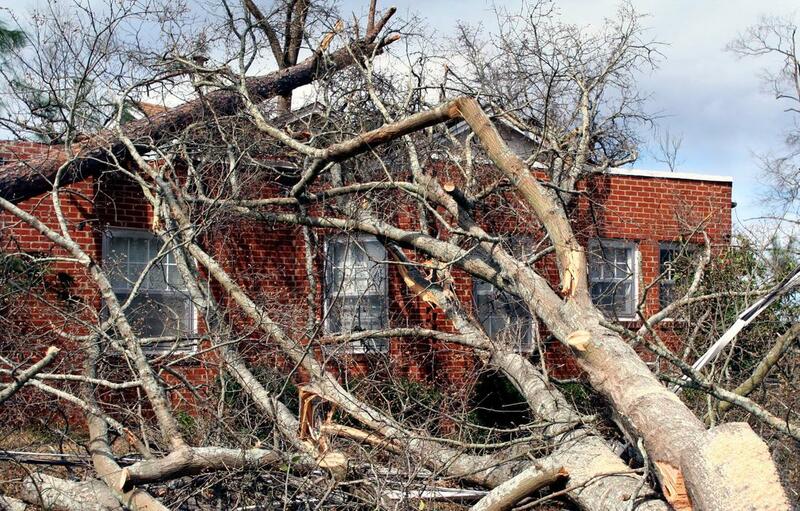 If any trees have fallen on your home or garage, those will be the first things we deal with. After that, we’ll remove any fallen and damaged trees, branches and stumps from the rest of your yard. Once we get rid of the things that are in our way, or causing damage to your house or yard, we can begin to rebuild your landscape. If a tree is damaged beyond repair, but remains in the ground, we will have no choice but to remove it. Of course, we will do everything in our means to try and save the tree first, but ultimately the deciding factor is your safety. If a tree’s foundation is too damaged or it appears that it could cause issues in the future, we will remove it entirely, including the stump, so that it is not another headache for you to deal with later. Our experts will assess the situation and come to the best plan of action. Now that everything is cleaned up, we can look at options for moving forward. If there was minimal damage done, we may even be able to save trees by eliminating the damaged sections with a little tree trimming and tree pruning. If the rest of the tree is in good shape, we may not need to remove it entirely. The most important thing however, is making sure that we eliminate any possible hazards or weak spots that could harm you in the event of another storm. Knowing that storms are inevitable gives you an advantage – you can prepare for one! Hiring a professional arborist to come and inspect the trees in your yard can be extremely helpful. We will carefully examine each tree to check for signs of disease, decay or damage. If any of these things are found, we can remove them right away, which will eliminate any vulnerable spots that can affect a tree during a storm. Contact us today to start your inspection with our storm damage services.